Have you ever gotten directions from a friend like this, “Yeah! Two lefts, a right and then call me from your cell phone and I’ll tell you the way from there.”? So, being a good friend, you trusted their directions and followed every “right’, “left’ and “straight’ only to find your cell phone out of minutes and your pockets completely empty of change when you needed to call him. Well, I just explained my exact situation arriving in Estremoz – one of the more beautiful walled cities in the Alentejo, which is somewhat like saying that sunflower in front of you is the most beautiful amongst the field of flowers that it rests in. I had been given the name of Luis Louro, the son of the owner and winemaker at Quinta do Mouro, as a contact to visit during my trip, and the one to give me the ever so vague instructions that would lead to close enough to the Bodega that I could call him upon my approach and be directed the rest of the way. Unfortunately, being out of both minutes and change, I found myself driving down a remote vine-lined road that sat just on the outskirts of the city wall which, just so happened, to take me directly in front of the gates of Quinta do Mouro! Getting out of my car, I noticed above the white arch that led down to the winemaking facilities, a small plaque about 5 inches square inscribed with the words Quinta do Mouro. Leaving my car, I walked past the plaque directly into a very surprised Luis. In all honestly, I don’t think he knew who I was at first. Evidently, not many people find this Estate on their first try other than noticing the huge Ã‚Â¨Quinta do Mouro” sign painted on the side of a building only visible from the main highway. Quinta de Mouro, located in the Alentejo, is known for its ability to bend the rules in winemaking. Founded in 1990, and have released their first vintage in 1994, it is owned and operated by Luis’s father, a practicing dentist, who elaborates wines that never quite fit a specific mold. 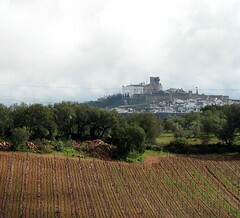 The 22 hectares of vineyards, which surround the estate and merge into the land that borders the city of Estremoz, produce a variety of grapes such as Trincadeira, Cabernet Sauvignon, [Touriga Nacional->https://catavino.net/archives/320/2006/03/23/], [Tempranillo->https://catavino.net/archives/111/2005/09/20/] and [Alicante Bouschet->https://catavino.net/archives/303/2006/02/24/]. Luis explained that while it takes 4 years for a vine to produce worthy grapes, his father is not afraid to rip out vines that just weren’t making it. Even today, they continue to push the boundaries of what can be done by experimenting with varietals such as Petite Sirah – a variety I’m quite fond of found in California. In fact, I just so happened to have the opportunity to try their Petite Sirah from a stabilization, and although it was called a “Petite Sirah’, it was not of the variety I am familiar with from California. Richer and considerably denser, it obviously has potential despite Luis’s hesitation as to what they’re actually going to create with it. In regards to their bottled wines, from the ones I had the opportunity to sample, both the Quinta do Mouro and the Zagalos, I felt that they were some of the most interesting wines that I have tried from the Alentejo. Not fitting any one genre, they displayed both the depth and complexity that made me curious as to what might develop in the following sip. Unlike other wines these had a mysteriousness that led me to flavors I had not yet encountered in this region. As far as recommendations, for longevity look for the ‘Quinta do Mouro’ label for a wine that will age well over the next 5-10 years depending on the vintage. While their Zagalos blend is a nice wine for grilled meats and easy to approach. Since 1998, Luis Duarte, who I have mentioned before in conjunction with Herdade de Malhadinha and Esporão, has been consulting on Mouro’s wines. 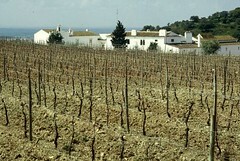 His largest contribution to Quinto do Mouro is to help improve the quality of their wines. Mouro’s wines are big and interesting and not necessarily made for the market, but rather for the winemaker. Luis’s father loves wine and the process of making it, and this passion has led to a style that is all their own. For those of you who haven’t had a chance to try their wines, make sure to pick up a bottle and try it out.